USPA NEWS - Beneficience.com Public Relations (PR) partnered with USDAC.com/PSOTU to host an event to add value and uniquely increase awareness of the United States Dept. 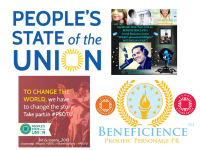 Of Arts and Culture's "People's State Of The Union 2016 event"(#PSOTU) via story circles held from January 23rd to 31st, 2016 across the U.S.
Beneficience.com Prolific Personage Public Relations (PR) of Beverly Hills, Hollywood, Chicago & London UK officially partnered with USDAC.com/PSOTU this weekend past Saturday (9am PST/11am CST) to host an event story circle online that uniquely increases awareness of the United States Dept. 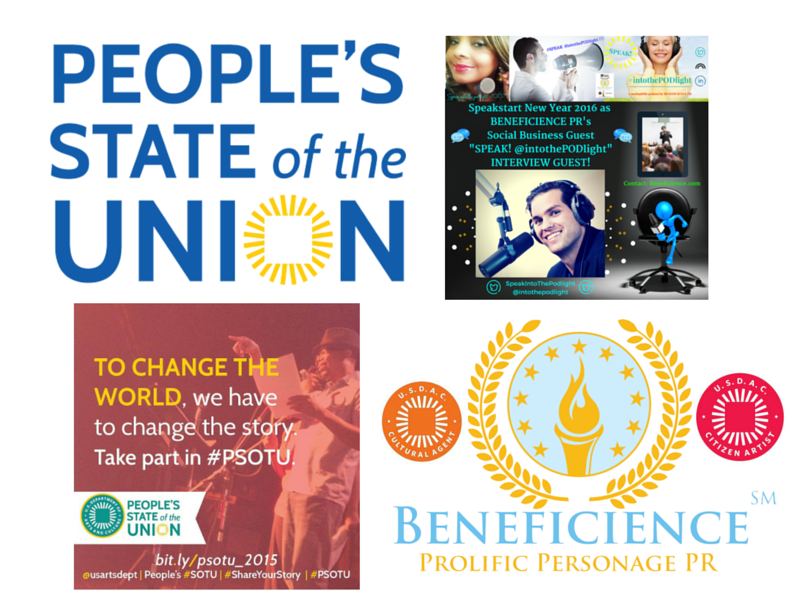 Of Arts and Culture's "People's State Of The Union 2016 event"(#PSOTU) via story circles held from January 23rd to 31st, 2016 across the U.S. The People’s State of the Union is an invitation to supplement the President’s stories with our own, together hosting a national conversation in our own homes, schools, houses of worship, and community organizations. Then, inspired by stories submitted from across the country, a group of poets collaboratively composes the Poetic Address to the Nation, broadcast live. This year's Poetic Address will take place on Feb. 20 at 7:30pm. Under the slogan "To change the world, we have to change our story!" The podcast host Tracey Bond, PhJrn who also owns the Beneficience.com A Prolific Personage Public Relations digital operative opened up the public event with a dramtaic conversation titled "The Good Guys and The Bad guys" a scripted performance shared by Anne Rhodes one of the many #PSOTU2016 event Story Circle hosts. This which created an auditory situation to help participants paint their own conclusional picture regarding some of the culture bias conversations , the script illustrates the public as having today. This on-air platform spoke to a variety of listener audiences distributed by Beneficience.com PR for #PSOTU2016 on "SPEAK! #intothePODlight Saturday January 30th, 2016 from 11:00am to 12:00pm cst. The mid-day audio #storycircle event continued to speak into the pulse of the #PSOTU story portal by featuring two Illinois Social Entrepreneurs that called in to share: Mary Bomar - Speaker, Dramatist & Owner of A Perfect Silhouette Boutique & Traci S. Campbell - CEO Founder of CHAMP Within Community Project and Producer of The BIBO Awards (Beauty In / Beauty Out Tour). These women offered several experiences, and actionable ideas for social solutions in the audio podcast onversations about #PSOTU2016, that can be heard sans politicking at: http://www.blogtalkradio.com/speakintothepodlight/2016/01/30/beneficiencecom-invites-you-to-join-our-130th-psotu2016-storycircle-on-air To learn more about last year's 2015 People's Address To The Nation at The Peoples State Of The Union, whose tagline reads: "a project of a people-powered United States Department of Arts And Culture" visit: http://peoplesstateoftheunion.usdac.us/poetic-address The 2015 PSOTU action is over at the time of this news report, but their site content states "...the stories live on! You are welcome and encouraged to perform and re-interpret the 2015 Poetic Address and to use these stories as inspiration for new creative works!" The public is invited to share their favorite parts or reflections on social media: at USDAC.com/PSOTU using their adopted hashtags: #PSOTU and #PoeticAddress.